FreshMarine.com - Ornate Box Turtles - Terrapene ornata - Buy Hatchling Ornate Turtles Now and Save! Terrapene Ornata also known as Western Box Turtle or Ornate Box Turtle is a species of North American Box Turtle. This reptile has an intriguing behavior and at times humorous personality and is rated as one of the most known and captivating turtle of Southwestern desert. It grows around 6 inches in length. Ornate Box Turtle�s carapace is broad and oval and usually somewhat flattened at the top. Carapace is made of expanded and fused back bones and ribs which are covered with scutes. It is dark brown in color with distinct yellow lines which radiate. Plastron is made of fused bones which are hinged to permit protective retraction. It encloses head, legs and tail and provides protection against any danger. TerrapeneOrnata has unusually large eyes, mouth with a horny beak and no teeth. Neck, legs and tail are covered with reptilian scales. Color of the skin is grayish brown and head color varies from grayish brown to green. There are mostly four toes on each hind foot. Western Box Turtle males differ from female as males have depressed plastron and red eyes whereas females have flat plastron and their color of the eyes are yellowish brown. Expected life span for these turtles is 100 years. They are mostly active from April till October. They do not need much area to spend their lifetime. Basking in the sun is its first activity of the day. They mate in spring and fall. Females have an ability of storing sperms through which they can lay several clutches of eggs from a single mating. They can also delay laying eggs depending upon the external calamities. A shallow nest is dug which is moist and has well drained soil and eggs are laid in that nest. The eggs then are abandoned and coming hatchlings have to fend for themselves. 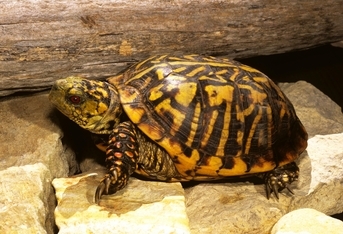 Ornate Box Turtles are dry land turtles and are found away from water bodies. Open habitats like pastures and open woodland are preferred by them for their natural habitat. This species is found in the grasslands of South Dakota, Texas, and Minnesota etc. These turtles are not very handy and they prefer an outdoor enclosure. A large area to move around and high fence to keep them from escaping is essential. Provide several hiding spots and a thick layer of loose soil for burrowing. A pan of water for soaking is also must. Temperature should be around 80-85 Fahrenheit. Humidity level should not increase 60%. Their enclosure should not be overheated so make sure to offer plenty of shaded areas. Though on cooler days heat lamp must be placed in the shelter. Western Box Turtles are highly carnivorous. Their diet includes worms, snails, beetles, crickets and grasshoppers. In captivity, they can be offered chopped fruits and vegetables. Dark green leafy veggies like lettuce and fruits like melons and berries can also be fed. Do not feed cat food as it is high in protein and fat and obesity could be one of the outcomes. Access to clean water is important.